This weeks Bloggers Challenge was to use a magazine or photo as a focal point in your project. The October '07 issue of the TJNL seemed like a great starting point for this challenge - as fellow Turbo Team Member Gerrie had suggested the Scrunchie Technique to Pat a few months ago. Gerrie had sent me a sample of the technique, so I decided to put her sample to use in today's challenge. The piece she sent me was copper - so I morphed her scrunchie sample by adding brown embossing powder so it would work with my image. Yes, the scrunchie technique actually uses a magazine. 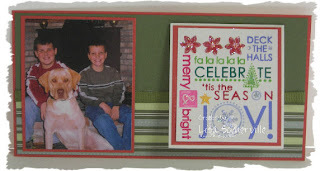 I joined a Christmas Card swap hosted by my friend Robin, after this years Stampin' Up! convention - in that swap I had received a great swap card from Maggie Pinque - she had left a space for her photo and had a small card tied with ribbon on the front for you to put your holiday message. Maggie's finished piece was made to fit into a business sized envelope. I used Maggie's swap card as my inspiration for this finished card. This finished piece measures 6 5/8" x 3 1/4" and is made fit into SU's Small Open End Envelopes. 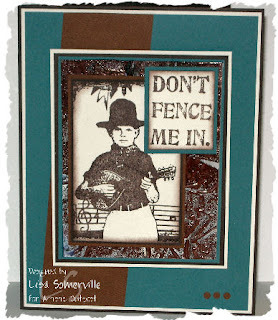 Stamped image was colored with markers then stamped on white card stock. Some images were accented with DD Glitter. Great job with your two challenge cards...both very unique use of photos and magazines! WOW both are fabulous! Love your Christmas card! Handsome young boys you have! They make a great focal point for you card! I love this photo card idea too! Maggie showed a whole bunch at Christina's last meeting -- they were all SUPER! Great job! Nice Lisa... both cards are great. Love the 'mini card' idea for the holiday card - may have to redesign mine! Great cards Lisa! The scrunchie technique looks really cool and your Christmas card is beautiful! Great cards Lisa! I love both of them but the Christmas card one is so cute! Wow, great cards. Love the cowboy card but oh my goodness, what you did to that Christmas stamp, all those markers, I'd be blind. That is the prettiest job I've seen done with that stamp. Love the boys and dog, great card. Love your Christmas Card!!! Very Bright and Cheery!! Hey, I think I saw the stamp that galloped away! lol! Both cards are fantastic. I love designs to add pictures to Christmas cards. WOW! Love this, Lisa, great idea for a Xmas card. What handsome sons you have Lisa! Great way to send a Christmas card w/pictures. EXCELLENT! Wonderful job on both cards. I love the vintage feel of the first card and it seems to have some shimmer on the background that I like. - Photo cards are always fun when they are done right & this one is. We both had cowboys on the brain for this challenge...although my cowboy should NOT sing! I also like your holiday card! You are still my hero!!! How cool both of these are. I especially love the one with the picture of the boys! Love them both. Great cards! I love all of the colors on the second card! Really cool techniques!